I've always loved anything metallic; I tend to stick to quite a black-white-grey colour palette nowadays but I always enjoy introducing different textures into a look. 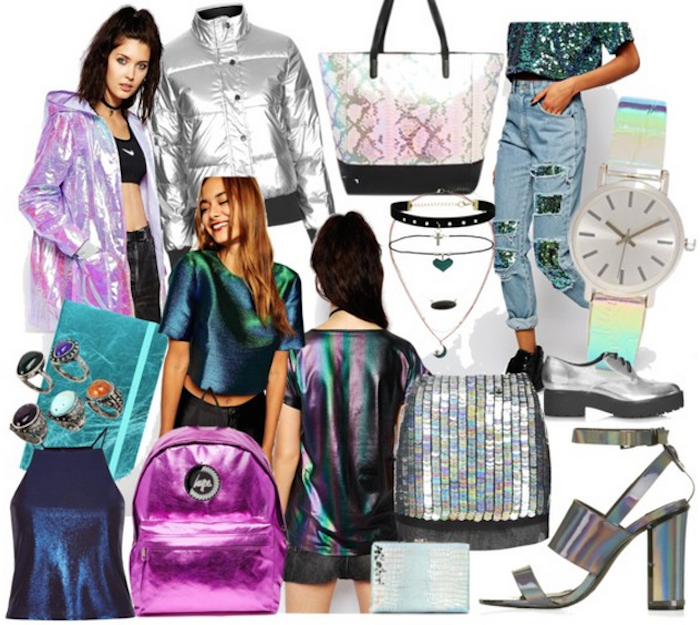 Holographic and metallic pieces have been huge for the last 2-3 years with the reemergence of 1990's trends and it's safe to say they aren't going anywhere soon! Metallics are really easy to wear in particular; the key is sticking to one metallic piece and dressing around it. Metallics can be dressed up or down but I personally like to wear them with less-dressy items to "grunge it up". The same goes for holographic items, although a lot of people tend to shy away from them as they're a bit more daring than metallics. The Topshop Armour skirt above, for example, would look badass teamed with an oversized vintage band tee tucked in and worn with a battered leather jacket. The Topshop 'Jodie' bomber jacket is definitely not to everyone's taste but styled with an all-black outfit and minimal accessories, it'd look über chic and bang on trend. The Ragged Priest is a brand I've loved for quite some time now, as they're fun yet completely driven by their own aesthetic and tend to make the trends, not follow them: the holographic rain jacket and sequinned 'Mom' jeans are personal favourites and again, can be worn in various different ways depending on your own personal taste! If you're not so keen on wearing metallics or holographics clothing-wise, the French Connection 'Jasmine' shopper, Hype pink backpack and Topshop 'Nuuna' notebook are edgy but easy buys to incorporate into your everyday style. How do you style metallics/ holographics? Lusting after anything at the minute?